Thanks Brewster Kahle for this donation of a chip from a Connection Machine 1 or 2. Now I just need to find an entire machine (see above)! If you have a CM you want to donate to the Digibarn, contact us! The Connection Machine was the first commercial computer designed expressly to work on simulating intelligence and life. A massively parallel supercomputer with 65,536 processors, it was the brainchild of Danny Hillis, conceived while he was a graduate student under Marvin Minsky at the MIT Artificial Intelligence Lab. Departing from conventional computer architecture of the time, it was modeled on the structure of a human brain: Rather than relying on a single powerful processor to perform calculations one after another, the data was distributed over the tens of thousands of processors, all of which could perform calculations simultaneously. The structures for communication and transfer of data between processors could change as needed depending on the nature of the problem, making the mutability of the connections between processors more important than the processors themselves, hence the name "Connection Machine". 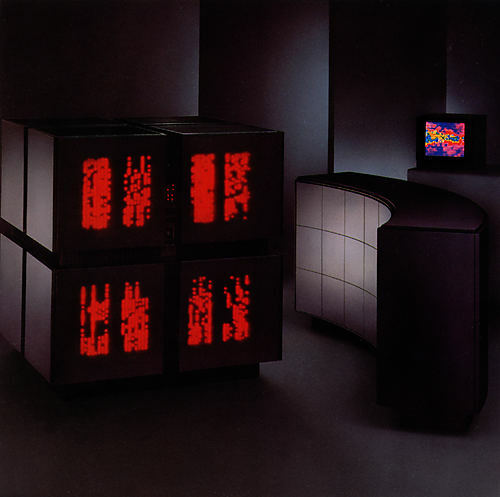 From 1983-1985 I directed the packaging and industrial design of the Connection Machine CM-1 at Thinking Machines Corporation, working with industrial design consultants Allen Hawthorne and Gordon Bruce, and mechanical engineer consultant Ted Bilodeau. The CM-2, released in 1987, was a more advanced successor contained in the same physical package. The form of the machine was to express both its function and the passions of its creators: the dream of producing a "Machina Sapiens," a new genus of living, thinking machines. At its height, there were Connection Machines at 70 installations around the world. In 1983 Tamiko Thiel joined the start-up Thinking Machines Corporation to direct the packaging design of the Connection Machine CM-1 / CM-2. The doctoral thesis of W. Daniel Hillis, then PhD. 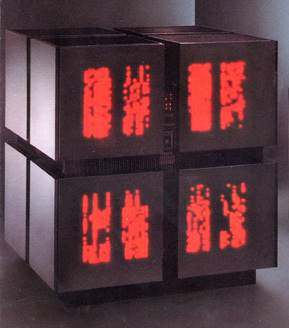 candidate under Marvin Minsky at the MIT AI Lab, the Connection Machine was the first commercially available massively parallel supercomputer and in its time one of the fastest computers in the world. Thiel’s design challenge was to find a form for its 12-dimensional network of 65,536 processors that was not only buildable, but also communicated the passion and conviction of its makers that this was indeed the first of a new generation of machines. Tamiko Thiel has a B.S. in Product Design Engineering from Stanford University, an M.S. in Mechanical Engineering from MIT, and a Diploma in Applied Graphics from the Academy of Fine Arts in Munich. She considers the Connection Machine to have been her first artwork and has gone on since then to develop an international reputation in the media arts. Currently she is a Research Fellow at the MIT Center for Advanced Visual Studies, where she is developing the narrative potential of interactive virtual reality as an artistic medium for addressing cultural and social issues. Know anything about the Connection Machine (or have one you would like to donate? ), contact us!